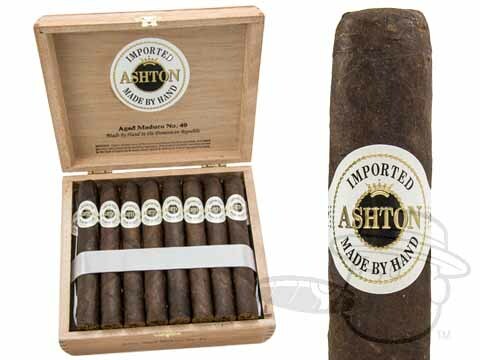 The Ashton Aged Maduro #40 is tagged with free shipping. If you order this product, your entire order will receive FREE BCP Ship Saver shipping! Ashton Aged Maduro #40 delivers unique maduro character in a traditional 6x50 Toro vitola. Get the greatest value on Ashton Aged Maduro #40 with this special 2-Box Deal! I can definitely call myself an Ahston Aged Maduro aficionado. I have been smoking Ashton Aged Maduro cigars for over 25 years. mostly the Ashton #40, since this is a comfortable smoke for me. If I cannot find the #40's, I sometimes will smoke a #50. However, the 6 x 50 of an Ashton #40 is a good ring size. I pretty much stay in the area of a 50 or 52 ring gage for the most part. The Ashton Aged Maduro #40 is my go-to cigar for a great smoke and when I want to wind-down after a long day. I would recommend they to anyone who loves cigars and enjoys the sweet smoke flavor of a maduro wrapper on one of the best dominican cigars made. Remenber, "a woman is a woman, but a cigar is a good smoke." Ha! I have been sure never to let my humidor be without Ashton Maduro cigars. These are hands down the best of the best cigars to smoke as far as I'm concerned. Ashton Aged Maduro #40 is rated 5 out of 5 based on 3 customer ratings.